All the features you want. All in one place. We provide self storage to all kinds of people in the greater Tucson area. Regardless of your lifestyle, one of our units is just the right size for your belongings. No matter which space you choose, you'll enjoy convenient features like climate control. Browse through our selection and get started today! Learn more about the units we offer. Browse through our packing advise. 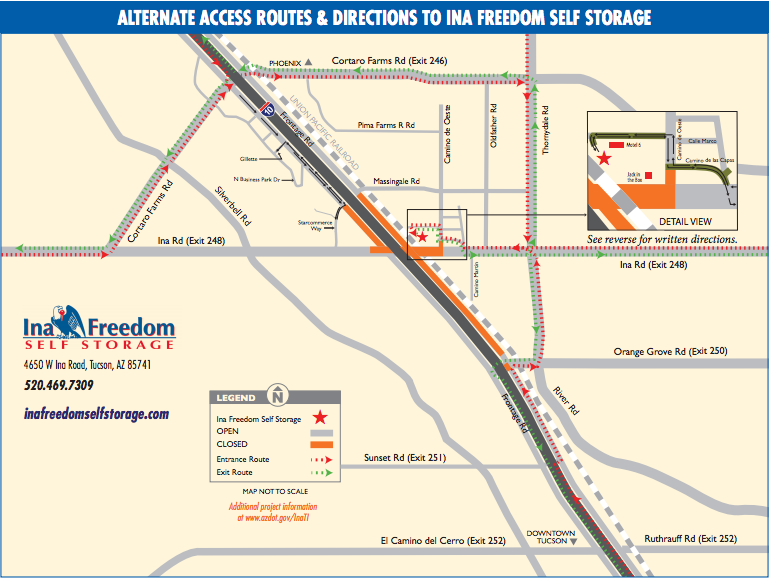 Ina Freedom Self Storage is a brand new facility in Marana, Arizona. We’re located just off the intersection of I-10 and Ina Road, which makes us the perfect option for residents and businesses in the greater Tucson area. As you conduct your search for self storage, we encourage you to tour potential facilities and let the properties speak for themselves. When you pull up to our location, we’re confident that you’ll be impressed with what you see. We are most proud of our dedicated staff and our beautiful facility. On move-in day, you’ll enjoy our Budget Truck Rental and our convenient drive-up access, only to be welcomed by a spotless storage space. If you’ve lived in Arizona for some time now, you know how intense the heat can get. That’s why every last one of our storage units features climate control, which means your belongings will leave your unit in the same great shape that they arrived in. While our rates are already pretty exciting, we offer additional discounts to qualifying customers. If you’re a student, senior citizen, active military member or local business, you’ll enjoy an extra 10% off your monthly rent! We even allow a number of different payment methods for our storage tenants. You can take care of your bill in our office, set up automatic payment, mail in your check or even manage your account by calling us. Our features are endless, so contact us today for further details! From eastbound I-10: Take Exit 246 (Cortaro Farms Road) and turn left under Interstate and proceed to Thornydale Road. Turn right on Thornydale, right on Ina Road, and right on Camino de Las Capas to Camino de Oeste. Turn right on Camino de Oeste, then take first left behind Motel 6 to address. From east of I-10: Go to Ina Road, turn right on Camino de Las Capas to Camino de Oeste. Turn right on Camino de Oeste, then take first left behind Motel 6 to address. F From west of I-10: Go east on Cortaro Farms Road to Thornydale Road. Turn right on Thornydale, right on Ina Road, and right on Camino de Las Capas to Camino de Oeste. Turn right on Camino de Oeste, then take first left behind Motel 6 to address. To eastbound I-10: Exit behind Motel 6 and turn right onto Camino de Oeste. Turn left onto Camino de Las Capas to Ina Road. Turn left on Ina, right on Thornydale Road, right on Orange Grove Road to I-10 eastbound. To westbound I-10 or west of I-10: Exit behind Motel 6 and turn right onto Camino de Oeste. Turn left onto Camino de Las Capas to Ina Road. Turn left on Ina, left on Thornydale Road, and left on Cortaro Farms Road to I-10 westbound or under Interstate to west side of I-10. To east of I-10: Exit behind Motel 6 and turn right onto Camino de Oeste. Turn left onto Camino de Las Capas to Ina Road. Turn left onto Ina. © 2019 Ina Freedom Self Storage, partners and affiliates.